Check the features of the Panasonic LUMIX DMC-G7KK DSLM Mirrorless 4K Camera, 14-42 mm Lens Kit (Black) . 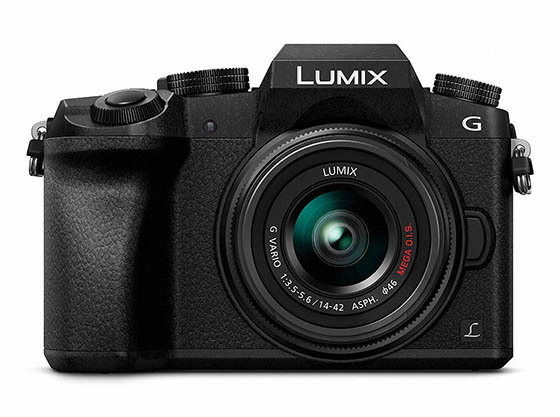 When compared to the Panasonic GH4, it is clearly an excellent value. See our review of the GH4. The DMC-G7 has a Four Thirds size 16MP Live MOS sensor that, when paired with its Venus Engine processor, allows for 4K video and stills. The G7 has a Micro Four Thirds lens mount, which has a 2X crop factor. The G7 has a 3″, 1.04M dot LCD that can flip to the side and rotate 270 degrees. This is helpful for video recording overhead or ground level shots. The LCD is touch-enabled, allowing for easy rack focusing, immediate AF point selection, menu navigation, and image playback. Shots can also be composed on an average-sized but still very nice OLED electronic viewfinder that has 2.36M dots. The camera switches to the EVF as soon as you put your eye to it because there’s a sensor just below the display. While the G7 is not quite an “A” camera, this price makes it an excellent value as a “B” or a starter camera. The biggest liability of the G7 is that there is no headphone jack. Most shooters who shoot video with DSLRs use external audio recorders like the Zoom H4n so if that’s how you work, the lack of a headphone jack may not be an issue. Monitoring audio can make a big difference in quality. It also has proprietary USB connectors like all the other Panasonic cameras. This adds complexity, but is not really a significant problem. The other big issue is that it has a 29 minutes clip limit. But it has a giant plus and that is lack of noise in the picture. Compared to the Panansonic GH4, the G7 was vastly superior when the ISO was cranked up high. In fact at ISO 6400, the G7 was spectacular! The body is a magnesium alloy. For $600 this may be the 4K DSLR you’ve been waiting for. The price was originally $800, but was reduced for Black Friday. We don’t know if the price will stay this low. This is a great mirrorless interchangeable-lens DSLR “B” camera or starter.